If you want peace and quiet, Klong Toab beach is a great choice. There are only a couple of resorts here set on this very small beach, but it’s not far to the other, more developed beaches like Klong Nin or Long Beach if you want a change of scene one evening. As well as the two resorts on Klong Toab Beach, we’ve also suggested a couple of resorts nearby, in case you want to stay somewhere with more amenities but be able to visit Klong Toab easily during the day. Click on any link to view more photos, read guest reviews and book online. You can also use the search box to check availability instantly for Klong Toab hotels on your chosen holiday dates. You can also read previous guest reviews of Klong Toab resorts to see if it’s to your taste and you can book instantly online if you wish to secure your booking. Where Is Klong Toab Beach on Koh Lanta? Klong Toab beach is located just underneath Klong Nin beach in the centre of Koh Lanta. It’s the fifth-nearest beach to Saladan Village, which is where all visitors to Koh Lanta arrive, so Klong Toab Beach hotels have a transfer time of about 35-45 minutes from Saladan to anywhere along Klong Toab Beach. For a more detailed map of Klong Toab Beach itself, see our Google Map below. As well as the restaurants and resorts on Klong Toab Beach itself, there are also many places at neighbouring Klong Nin Beach and also along on the main road, giving you even more options. It’s also a short taxi or motorbike ride over to Lanta Old Town, just over the other side of Koh Lanta, which has some beautiful old Thai wooden houses and several seaside restaurants and bars to enjoy. 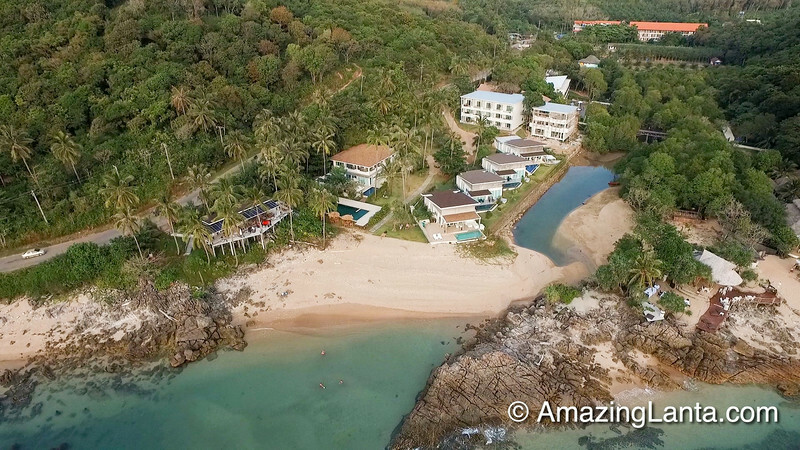 Here is AmazingLanta.com’s interactive map of Klong Toab Beach on Koh Lanta- click on the icons to see information on the hotels. Use the + and – buttons on the map’ top left to zoom in and out of the map. You can also drag the map area by clicking on it with your mouse and holding down the mouse button as you drag.